There is a curiously retro aspect to the energy policies of the Trump administration, with its embrace of resource nationalism and love of extraction over efficiency. Coal, so redolent of the age of Bismarck, is its touchstone. And while the latest attempt to make coal competitive again, the Affordable Clean Energy proposal, is quite obviously not going to do much to revive coal-fired power in the U.S., it does highlight the contradictions in the White House’s broader approach to energy. “ACE” would, among other things, shift away from pushing power producers to ditch coal in favor of cleaner fuels and technologies toward encouraging more modest upgrades to existing plants. It would also give states much more discretion in setting regulations for carbon-dioxide emissions from power plants. That sits rather oddly with the administration’s determination to strip California and other states of their powers to set vehicle-emission targets. But anyway. Thermal coal’s decline in the U.S. is structural. Tighter regulations are a burden, yes, but bigger problems are the availability of cheap natural gas, the falling cost of renewable energy and flat demand for power (see this, this and this). While relaxed restrictions could keep some coal-fired plants with marginal economics running, this would also tend to depress power prices overall and still won’t persuade anyone to fund a new plant designed to run for decades. Even the framers of ACE project a roughly 20 percent drop in U.S. coal consumption for power by 2030 if the Obama-era Clean Power Plan is ditched. What’s funny is that the one bright spot for U.S. coal miners this year is trade, an area where President Donald Trump is also playing to his base but in a way that could dim that bright spot. 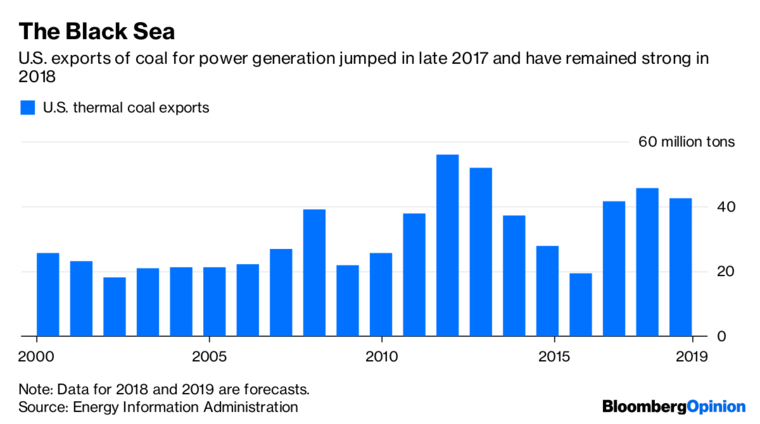 While domestic thermal coal consumption is expected to decline again this year and in 2019, exports have surged. This is due to a confluence of things. On the demand side, heat waves in Europe and Asia have stoked demand for coal imports and, as Bank of America Merrill Lynch points out in a recent report, unusually drawn-out contract negotiations between Japanese utilities and Australian miners have forced the former to make more spot purchases of coal cargoes. On the supply side, Chinese restrictions on domestic mining, including some forced closings, as well as various setbacks in Australia, Colombia and Indonesia, have tightened the market. All of this has pushed up prices, with Australian coal surging roughly 25 percent since late May. This creates an opening for U.S. producers. They sit at the high end of coal’s global cost curve but now look competitive for foreign utilities scouting for cargoes. In addition, the savage downturn in domestic consumption and production has left a lot of spare capacity ready to swing into action when the opportunity arises. This year may represent the best of the current export cycle. High prices have started to crimp Chinese demand and the weather is inherently unpredictable. Meanwhile, Australian exports are rising in response. While this might cap further gains in prices, an outright collapse doesn’t look likely either. London-based miner Glencore Plc was, of course, talking its book with bullish comments about coal on its earnings call earlier this month. But it was right that supply and demand remain relatively tight — which means U.S. exports continue to play a vital role. While the Energy Information Administration expects these to ease slightly to about 42 million tons in 2019, that would still be more than double the level of 2016. A wild card, of course, is the gathering conflict over trade. Embedded within this is another wild card: the president’s gathering legal problems, demonstrated in dramatic fashion on the same day ACE was unveiled. Besieged on that front, it is entirely possible the White House will seek to shore up support by turning more aggressive on other base-pleasing issues, trade among them. U.S. exports of thermal coal to China are minimal. Still, there’s no guarantee that the apparent rapprochement with Europe — a far more important market — will necessarily hold, especially as things turn more fraught in Washington. And the bigger issue is the knock-on effect that trade disruptions have on emerging markets in general, either through reduced economic activity or the pain inflicted by a stronger dollar. 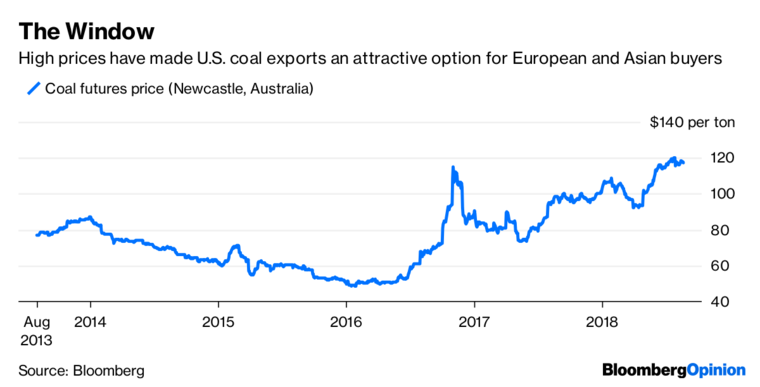 This could cool coal demand in general, with high-cost U.S. exports likely the first casualties with the same holding true for exports of coking coal, used in making steel. Trump’s affinity for “beautiful” coal, enhanced by its political usefulness amid other difficulties, is such that we can’t rule out even more intervention on its behalf, as ClearView Energy partners pointed out in a report published Tuesday. This is the administration that, after all, wants Americans to just pay extra to keep coal-fired plants open based on a Cold War law. Another blast from the past, and one that would also likely backfire. Copper prices fell on Thursday as the trade dispute between the United States and China escalated and the dollar strengthened on expectations of higher U.S. interest rates soon. Benchmark copper traded down 1.1 percent at $5,940 a tonne in official rings, heading towards the 14-month low of $5,773 a tonne hit last week. Earlier this week it touched a one-week high at $6,076 a tonne. “The Fed is on course to raise rates further this year and the dollar is up on that and the new tariffs, which will also hurt growth,” said Commerzbank analyst Eugen Weinberg. TRADE: The United States and China escalated their acrimonious trade war on Thursday, implementing punitive 25 percent tariffs on $16 billion worth of each other’s goods, even as mid-level officials from both sides resumed talks in Washington. DOLLAR: A rising U.S. currency makes dollar-denominated commodities more expensive for non-U.S. firms, which could potentially subdue demand. FED: Federal Reserve officials discussed raising interest rates soon to counter excessive economic strength but also examined how global trade disputes could batter businesses and households, minutes of the U.S. central bank’s last policy meeting showed. RATES: The U.S. central bank is expected to raise rates twice more this year and twice next year, a Reuters survey showed. The Fed next meets Sept. 25-26. DEFICIT: The global world refined copper market showed a 31,000-tonne deficit in May, compared with a 105,000-tonne deficit in April, the International Copper Study Group (ICSG) said in its latest monthly bulletin. SURVEY: A recent Reuters survey showed analysts on average expect a copper market deficit of 129,000 tonnes this year and a shortfall of 151,000 tonnes in 2019. PHYSICAL: China’s copper producers and traders are riding an unexpected surge of business that has pushed physical prices to their highest in nearly two years as fabricators rush to buy refined metal to avoid import tariffs on scrap that kick in on Thursday. CHINA: China accounts for nearly half of global copper consumption estimated at 24 million tonnes. The United States accounts for about 8 percent. PRICES: Aluminium was down 1.1 percent at $2,043, zinc fell 1.4 percent to $2,433, lead rose 0.5 percent to $2,023, tin lost 1.7 percent to $19,040 and nickel ceded 2.2 percent to $13,230.